Superman Celebration 2017 Photos, Part 4 of 4: Super Times! « Midlife Crisis Crossover! Superman Celebration 2017 Photos, Part 4 of 4: Super Times! 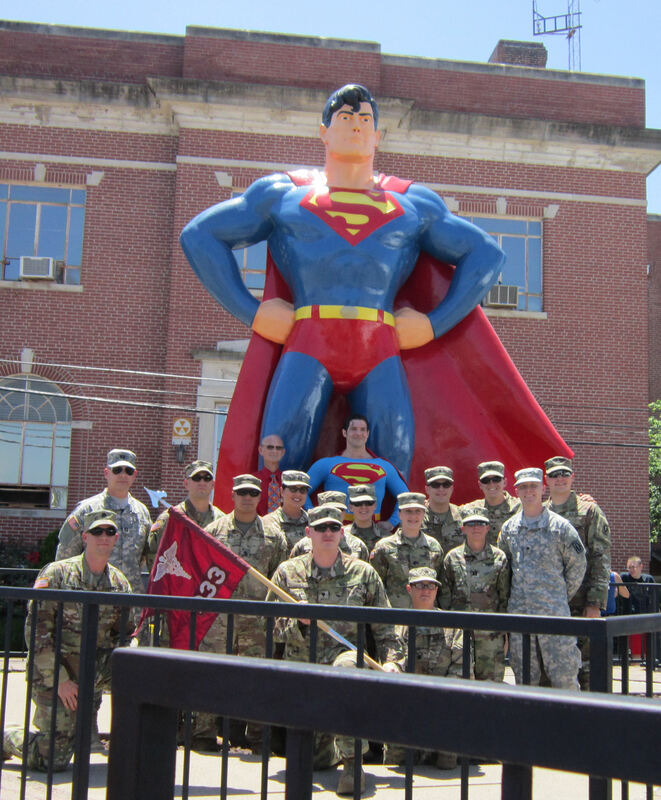 Superman posing with local military at the conclusion of a special ceremony inducting “honorary citizens” of Metropolis. 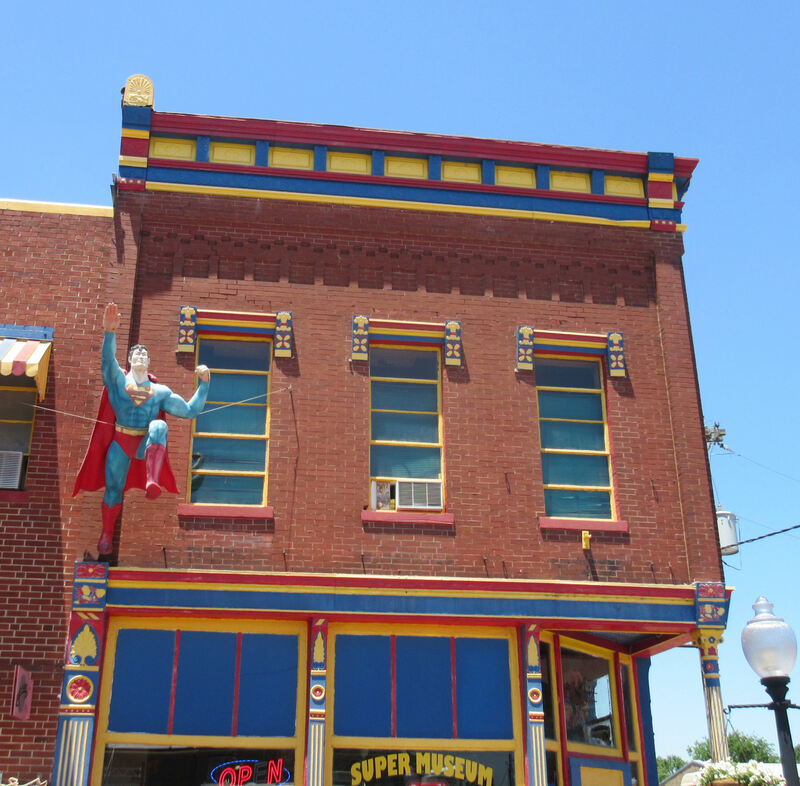 Our sixth visit to the town that adopted Superman once again felt like a sort of homecoming. Illinois even extended us the courtesy of raising their interstate speed limits and clearing out nearly all their road construction projects for the occasion so we somehow managed a record-setting four-hour drive time from Indianapolis. Numerous entrepreneurs brought fine wares and skills for the occasion, including a bevy of new businesses that took over previously abandoned storefronts and boosted occupancy rates along the main straightaway. Best of all, we enjoyed several mini-reunions with fellow fans we recognized (and vice versa) from past years’ autograph lines. The Celebration is like no other convention, and Metropolis is no mere sterile convention center. The Superman sights begin well before you reach the center of town. 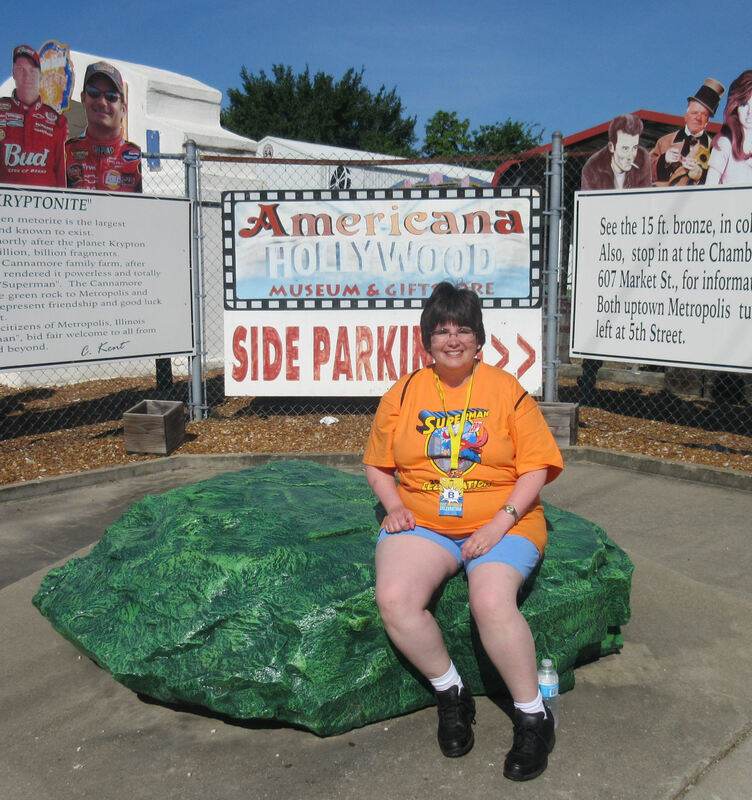 The first gas station off I-24 knows its clientele and decorates accordingly, including a pair of cardboard standees outside that once stood near the Super Museum. 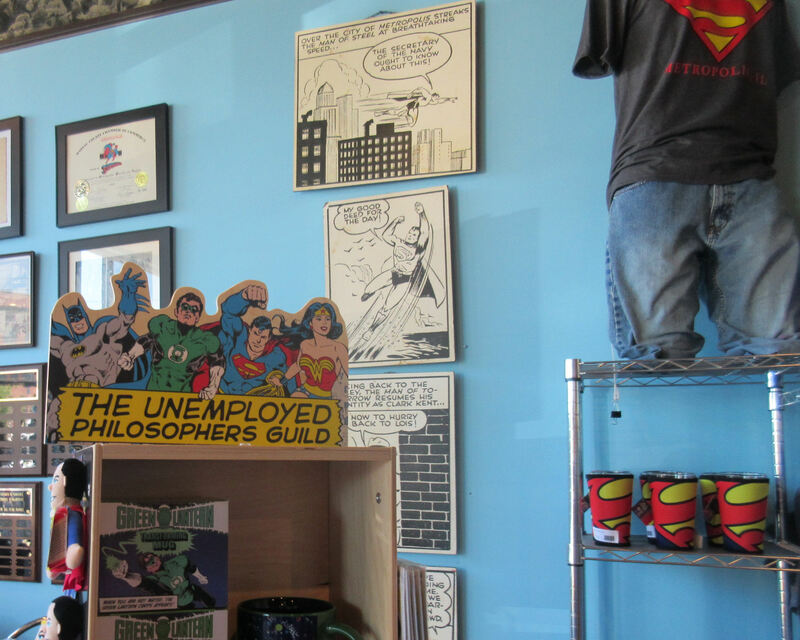 All four staffers in the adjacent Quiznos were likewise garbed in their favorite Superman shirts and/or souvenir shirts from previous Superman Celebrations. 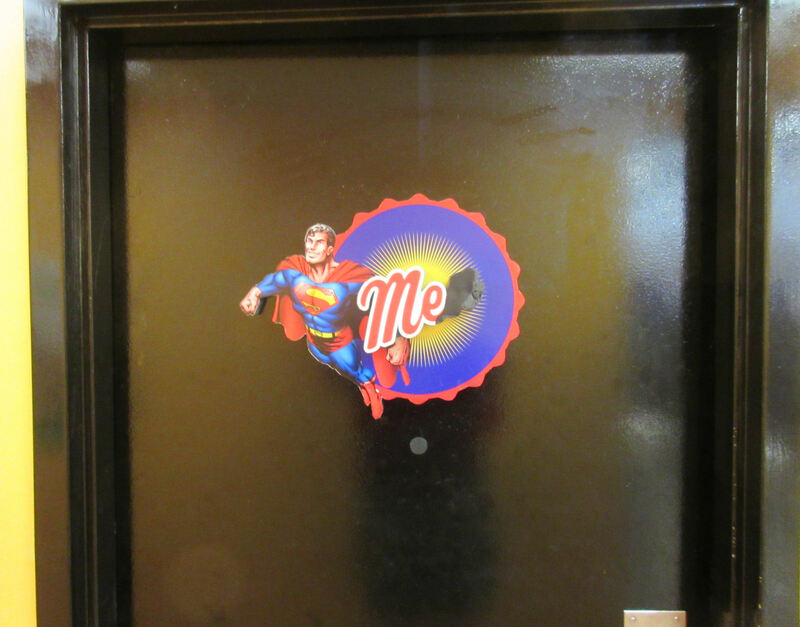 John Byrne’s Superman presents the gas station men’s room! Anne tells me the ladies’ was of course presented by Wonder Woman. 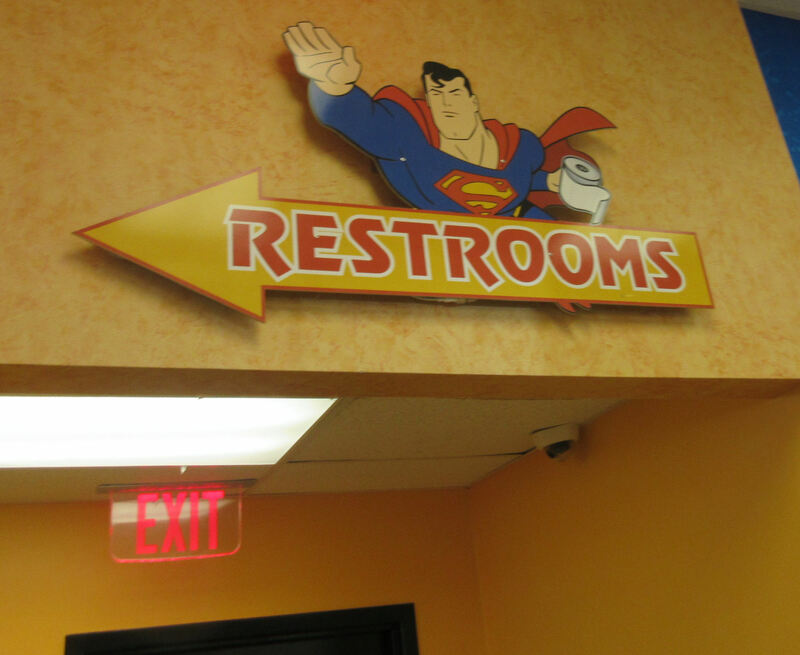 Superman: The Animated Toilet Paper. I wouldn’t be surprised if this secret squirrel knew the Adventures of Superman opening by heart too. Many a merchant supports the party in their own way. You say you like characters? 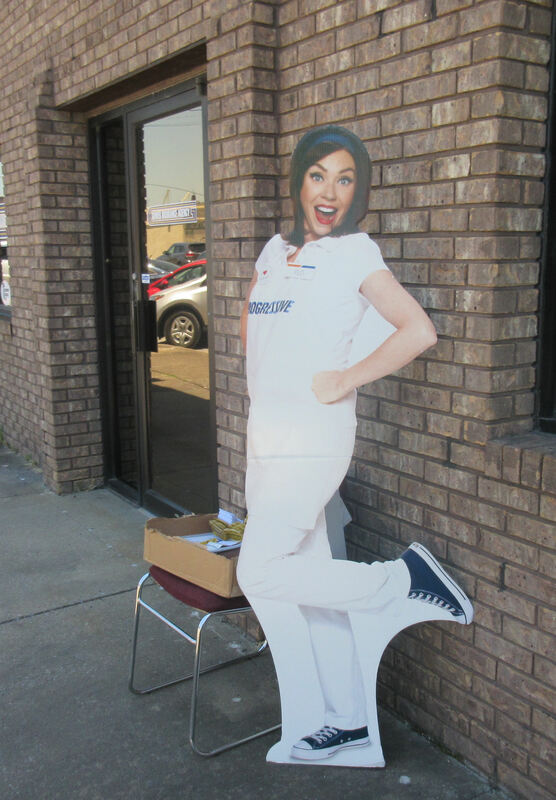 Well, insurance agents have characters too! Show of hands, who wants a Flo selfie? She’s arguably cuter than a gecko! Before diving in and throwing all our money at the food stands, first we had to stop by the Metropolis Chamber of Commerce to pick up our swag bags. This was a new thing for us and them. Superman merchandise and artifacts to scope out while we waited. Tons of super-hero clothing for sale all over the place, as you’d imagine. Once upon a time, the time-honored Superman Celebration procedure was that pretty much all events were free and all attendees were entitled to free celebrity autographs. Getting autograph session tickets meant camping out overnight in front of the Chamber of Commerce, or at least arriving in town for hours before sunrise to wait in line to score those memorable ultimate freebies, but it’s what we and everyone else got used to doing. Everyone was happy and everything was awesome. This year nearly all the events stayed as free as ever, but thanks to the Midwest convention explosion of the past few years, the words “free” and “autograph” don’t like appearing in the same sentence anymore. We’d heard talk last year that they’d eventually have no choice but to change things up for the Celebration to remain a fiscally feasible fete. As a couple who’s been doing the convention scene for some time now, to us this scuttlebutt was neither surprising nor heartbreaking, except in the sense that it represents Change and a departure from The Way Things Used to Be. For big fans who want to keep coming but absolutely cannot afford market prices, one limited free-autograph session was still offered for old times’ sake, at the end of Saturday during an extremely narrow window on a select few kinds of items. I hope that session went well and without stampede or bloodshed. Unfortunately now that events of this nature are a gigantic commodity, Metropolis has no choice but to keep up with the times or else run the risk of being left behind. Very, very few citizens want to see what a Superman Celebration without a single actor guest would look like. So this year the Celebration launched its own VIP program. 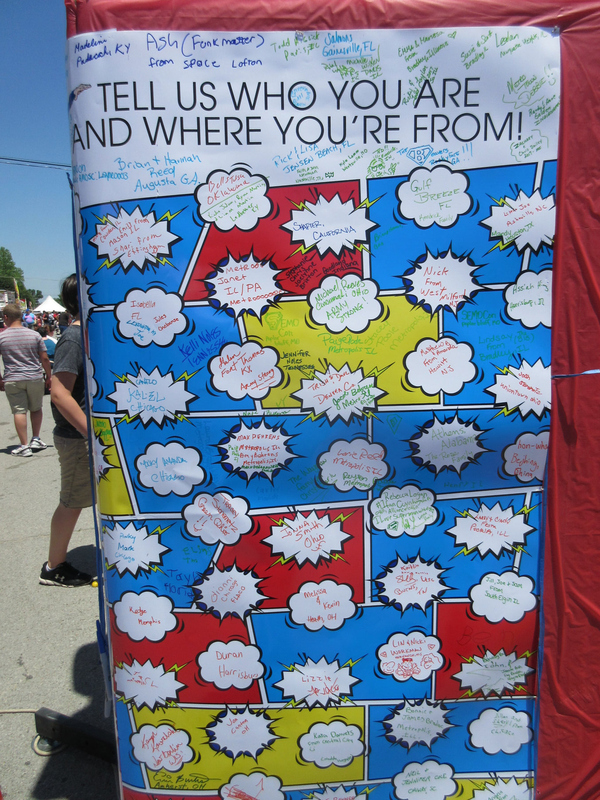 As an incentive for superfans and out-of-towners to give money to the city and thereby support the Celebration in particular and one feisty small town in general, the showrunners invented a tiered system — basically like crowdfunding without Kickstarter — whereby fans could buy memberships up front in exchange for guaranteed autograph session placement and other perks, depending on the tier selected. We couldn’t afford uppermost tiers, but guaranteed autograph access was a strong temptation. We loved the idea of sleeping in till a reasonable hour Saturday morning instead of getting up before the rooster, waiting on a cold sidewalk with only Hardee’s biscuits for nourishment, and watching the sun and temperatures rise on us. This new sponsorship program would net us the equivalent of a theme park Fast Pass, and for much, much cheaper than a Wizard World Chicago VIP badge. Brilliant, frankly. We were in. 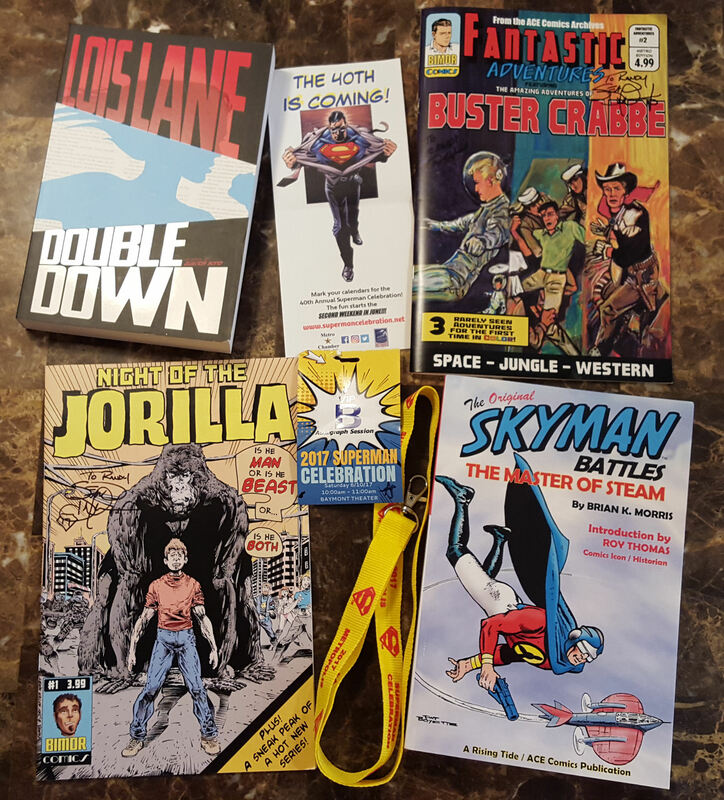 Our bag contained badges (non-laminated cardstock, alas) that doubled as our autograph session passes, Superman Celebration lanyards, sponsor-exclusive souvenir T-shirts, and a few extra cost-effective frivolities. Now we were on our way and ready to stroll Market Street, see the sights old and new, feast on festival foods, praise the cosplayers, and celebrate good ol’ whatshisname from Krypton. Though it was the last place we visited on Saturday, mention must be made of the best, most underrated attraction: Artists Alley and Writers Way, housed at the far north and requiring some dedication to track down in its out-of-the-way, not-so-air-conditioned HQ. Over half the room was filled with comics fans clamoring to meet special guests Amanda Conner and Jimmy Palmiotti, collaborators on DC’s bestselling Harley Quinn series. We left them to their enjoyment and moved on to go say hi to familiar faces and special guests alike. Chief among the former was writer Brian K. Morris, an awesome friend of this blog and lively supporting character at more than a few previous cons, including this one and this one. He writes novels and publishes comics and you may read things from him right exactly here, please and thank you. Also on hand was fellow writer and radio personality Sean Dulaney, his C2E2 2015 tablemate, who likewise brought comics and has a site and whatnot. 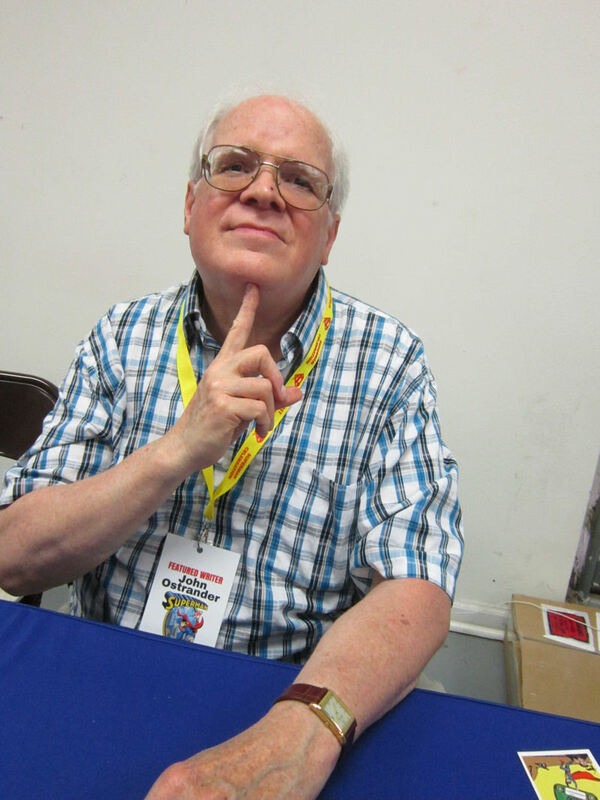 And to the left of their tables was artist Trevor Hawkins, who drew one of Dulaney’s covers as well as cover and illustrations for Morris’ latest old-school superhero novel, The Original Skyman Battles the Master of Steam. Also greeted that weekend: Gwenda Bond, author of an ongoing Lois Lane YA novel series in which a brave 16-year-old future journalist is already getting on-the-job training while negotiating school, pursuing Truth, chatting online with an MMORPG cohort she knows only by his username “SmallvilleGuy”, and dwelling on that one bizarre time an anonymous flying man saved her life. As of tonight I’m eighty pages into the second book Double Down and rather enjoying myself. 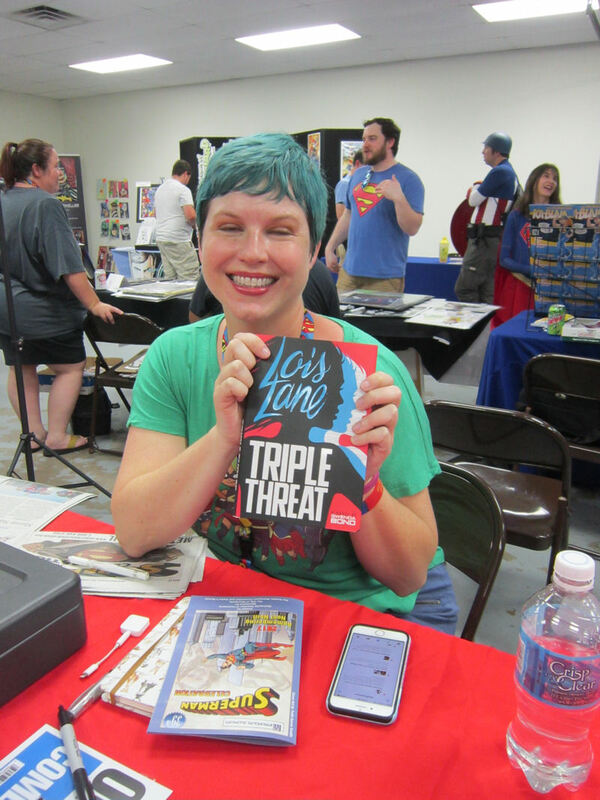 The third, Triple Threat, was just released in May. Bond also had the privilege of judging their “Superdog Show” contest and tweeting pics of so many good doggos, including a dead ringer for Krypto. I was especially thrilled to meet longtime comics writer John Ostrander. You might know him best as the co-creator of both Suicide Squad as we know it and the Jedi Quinlan Vos from the Star Wars Expanded Universe. (His original hard-boiled comics take was immeasurably superior to the Clone Wars surfer-dude version.) His creator-owned Grimjack series was among my first discoveries when I finally transitioned from buying my comics at drugstores to indulging in the joy of comic shops. He’s written numerous series over the years, including Martian Manhunter, Firestorm, The Spectre, Manhunter, The Kents (a Superman-related Western! 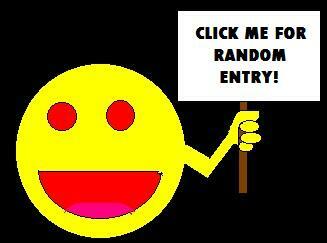 ), many a Star Wars project, several things for Marvel and other publishers, and more more more. If I had to highlight my favorite aspect among Ostrander’s works, it was that he wasn’t afraid to mess with the status quo, put his characters through radical change, and watch the drama unfurl and the scenery explode and the sparks burn everything to the ground. But in, y’know, entertaining ways. For fun he’s currently a regular columnist at ComicMix. In between the autograph lines and the actor Q&As and the A-plus snacks, Anne and I enjoyed the visions and vexations that awaited us all around town, all in the name of the Man of Tomorrow and every superhero who ever came after him. 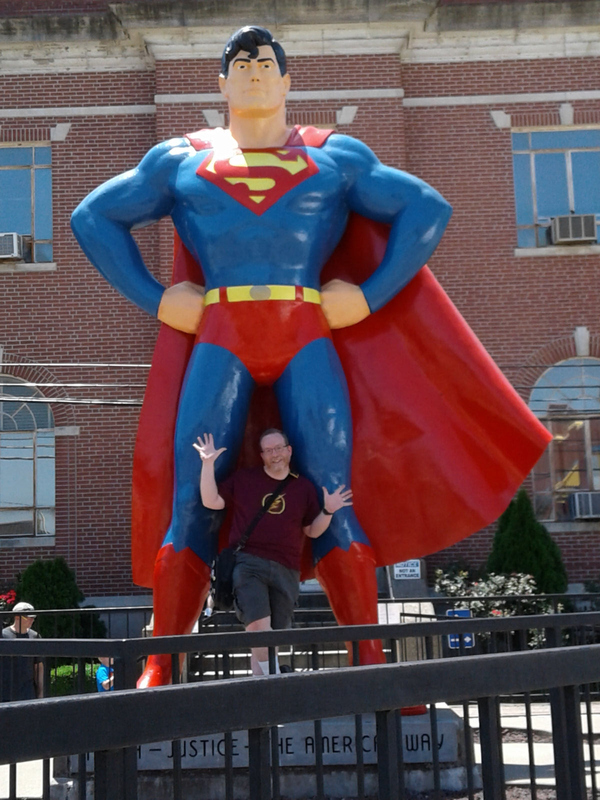 Mandatory shot of the world-famous Super Museum, a must-see at least once for any super-hero fan’s bucket list. 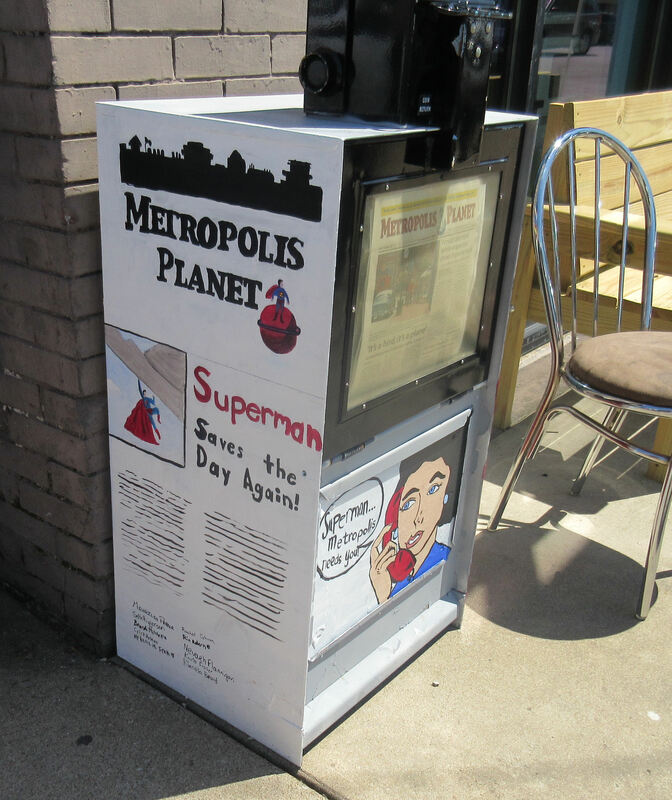 Newspaper box decorated by local kids, presumably with the blessing of grown-ups. 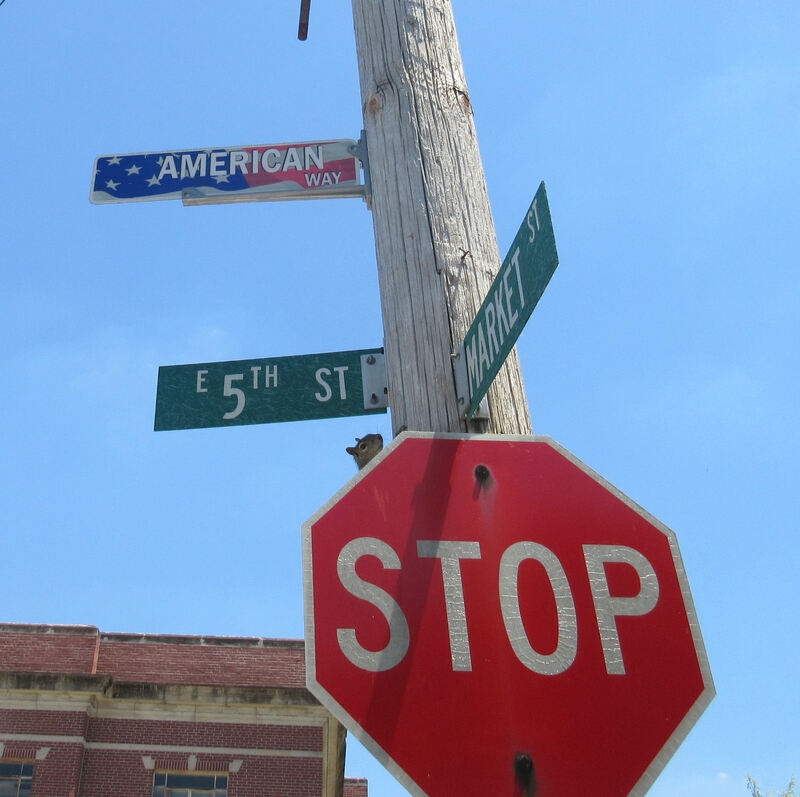 Fans flock to Metropolis from all over America and often from other countries. This year we had the pleasure to mingle with folks from Nashville, Georgia, California, LSU, and probably more. Squint and you can find our names! 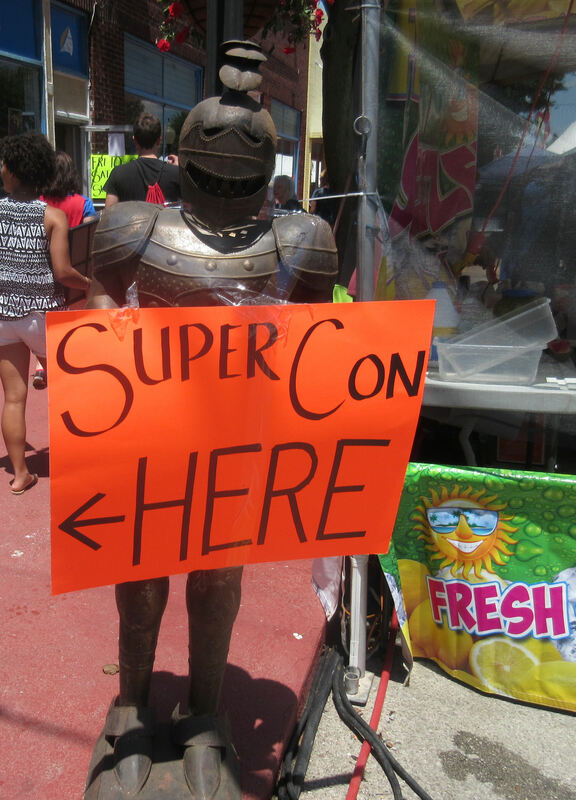 Another staple each year is “SuperCon”, which here is a phrase meaning “geek flea market”. A bunch of collectors and dealers share a space for the weekend and fill it with back issues, memorabilia, and clever craftwork for sale. Downtown Metropolis has murals here and there, including this one that I don’t believe we’ve showcased before. 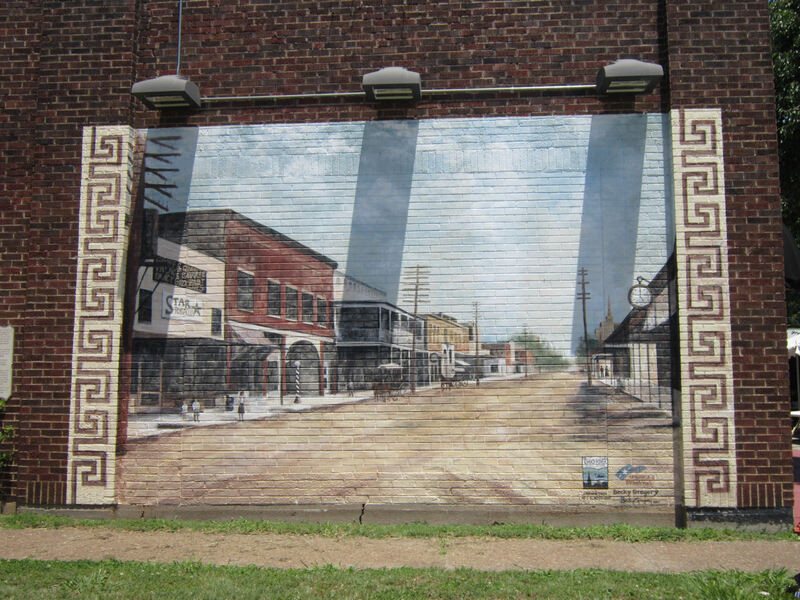 We firmly believe art makes any town better. We passed by Americana Hollywood on our way to our Saturday morning autograph/photo-op session and stopped for a quick pose with a ton of kryptonite. That’s Anne sporting the exclusive sponsors’ T-shirt. 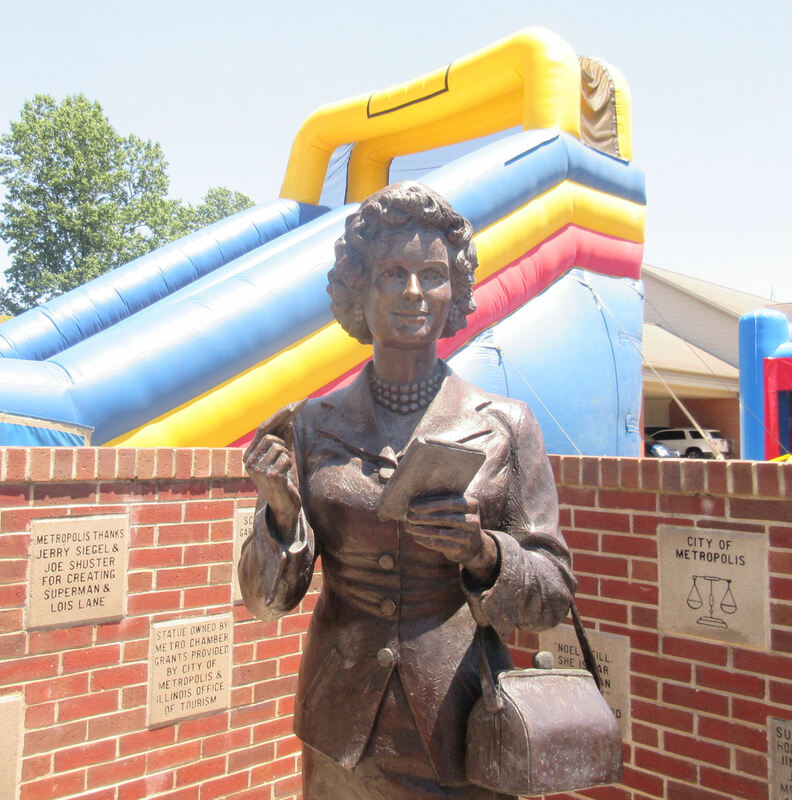 This year’s Celebration was bittersweet for those who remember Noel Neill, a.k.a. Lois Lane from The Adventures of Superman. Ms. Neill was a gracious presence in Metropolis for several years but passed away last July at age 95. This Lois statue, which we’ve photographed twice before, was erected in her honor in 2010 on the north end of Market Street as if to balance Superman’s presence on the other end. The surrounding temporary bouncy-house setups were either jarring or appropriately zesty, depending on how you look at it. Between this set of photos and our first three chapters, you get the idea: tremendous fun was had, Superman was cheered, sunburns were inflicted. I could write more about what we did with our Saturday afternoon away from the Celebration, but that’s best left as a separate entry unto itself. Part of me also wants to spend several hundred words lamenting those pervasive empty storefronts around town, particularly south of 5th Avenue and dotting the landscape all the way from the Superman statue to the riverside casino, but that thinkpiece is likewise best kept in reserve for some other moment. As for this moment, we’re glad we had the opportunity to drop in once more, and we look forward to future visits, which we imagine there’ll be for as long as they keep luring us back. The new additions to my reading pile, along with our new jazz-hands photos and other newly treasured fandom moments, will have to tide us over till then. Three cheers for new reading material! And soon the negative side effects will have faded, such as the nasty sunburn along my receding hairline, which is peeling and bugging me as we speak. Or the part where, after I tucked my lanyard and cardstock badge inside my shirt during our photo ops, I forgot all about it till hours later when I discovered that my nonstop sweating had glued the badge to my chest. « Superman Celebration 2017 Photos, Part 3 of 4: Festival Food!